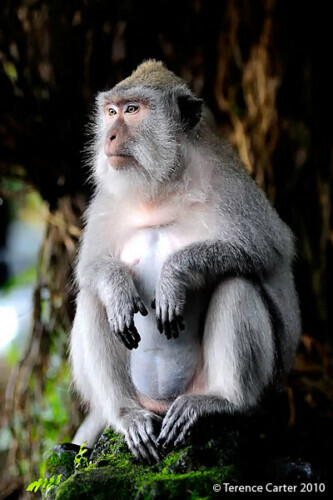 Ubud Monkey Forest must top the list of things to do for most visitors to Bali’s cultural heart of Ubud. It certainly made the top of our list — and it made our day. 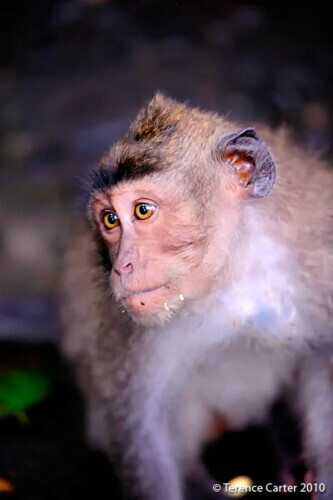 As animal lovers, we can’t resist getting up close to such adorable and amazingly intelligent creatures such as long tailed macaques. 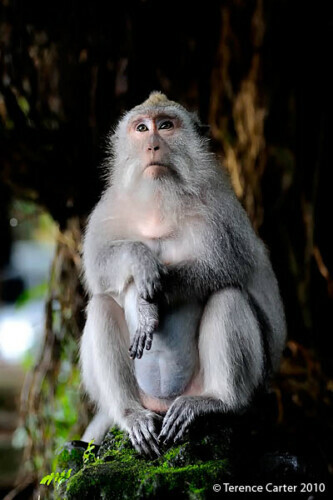 The fact that monkeys are so sacred to the Balinese is also a big appeal for travellers wanting to better understand the culture. 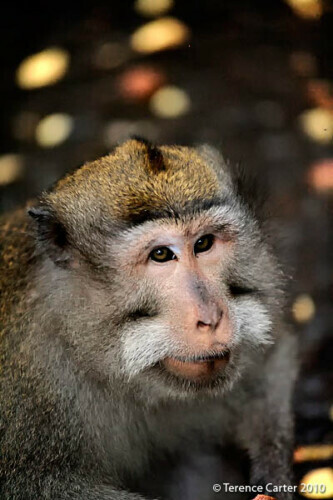 Visit a Balinese temple, museum or see a performance and you’ll note that the monkey features prominently in Hindu stories, sculpture, art, drama, and dance. 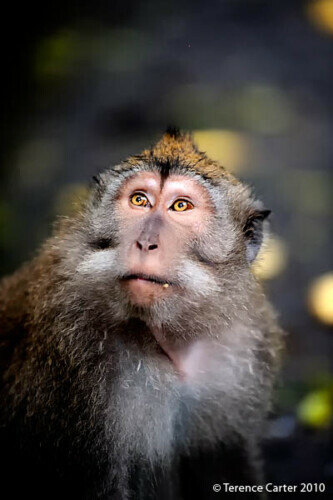 There are several temples at the Ubud Monkey Forest and the local villagers make special offerings here to the forest sanctuary and the animals themselves. 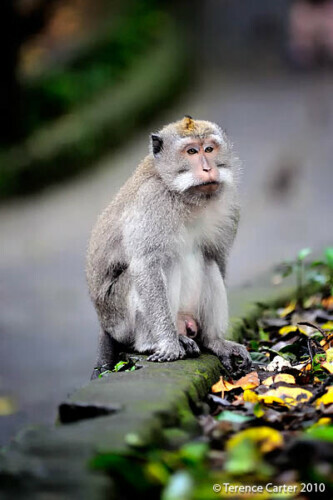 The Sacred Monkey Forest Sanctuary, Ubud, Bali, Indonesia. 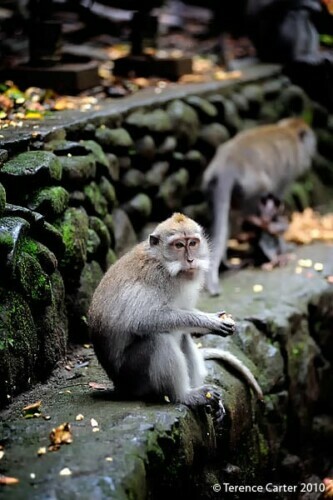 The Sacred Monkey Forest Sanctuary, Ubud, Bali, Indonesia. Copyright 2014 Terence Carter / Grantourismo. All Rights Reserved. 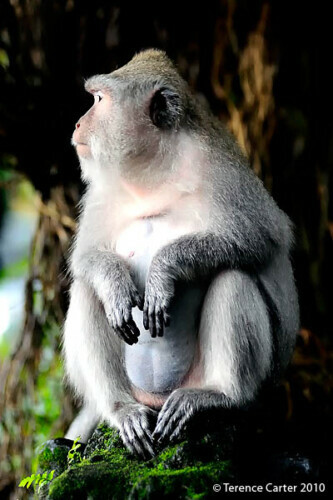 Ubud Monkey Forest is in the village of Padangtegal, on the edge of Ubud’s town centre, and is owned by the villagers who consider the sanctuary an important spiritual centre. They take care of the grounds and manage the sanctuary and the education and conservation at the facility. 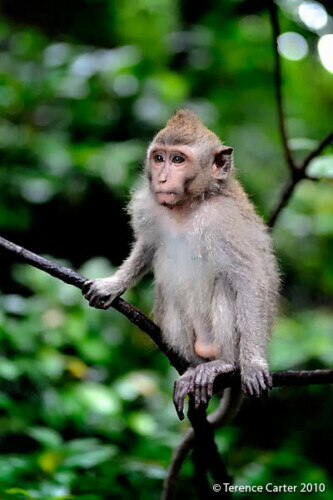 When we visited in 2010, we were told there were about 300 macaques at the Ubud monkey forest. Now we’re informed there are around 700. And if you stroll through with a bag of bananas, a packet of nuts, or any kind of fruit or food for that matter — or even a plastic or paper bag that looks like it may have contained anything remotely edible — I swear you’ll quickly feel as if you’ve met all 300 of them as you make your way through the park. There were around 95 girls and 35 guys (the rest are little ones) when we visited — and you’ll soon figure out which ones are the blokes, because they’ll quickly make themselves known to you. Yep, they’re the ones swinging from poles, beating their chests, bearing their beautiful albeit super-sharp teeth, getting right in your face, and fleecing your pockets if you dare not present them with that piece of fruit you’re hiding. What were you thinking?! Seriously. 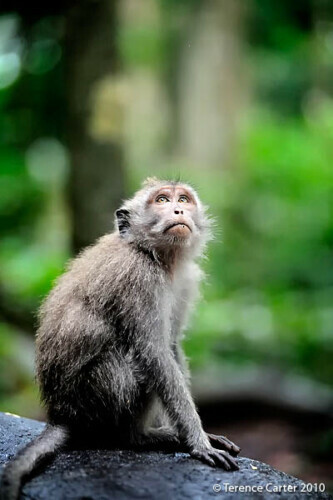 Aside from the monkeys, there are other things to see at Ubud monkey forest. For instance, some 186 species of trees flourish in the 12.5 hectares of forest. There are also three temples, dating back to the 4th century. 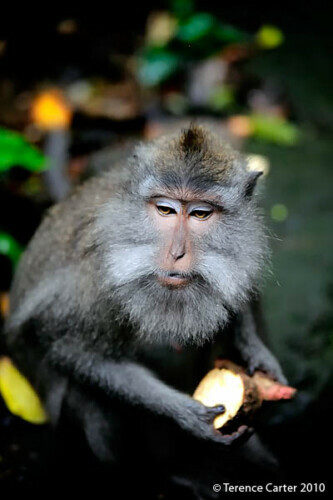 See the Ubud Monkey Forest website for more details (link below). The guidebooks recommend you don’t bring anything to feed the monkeys. 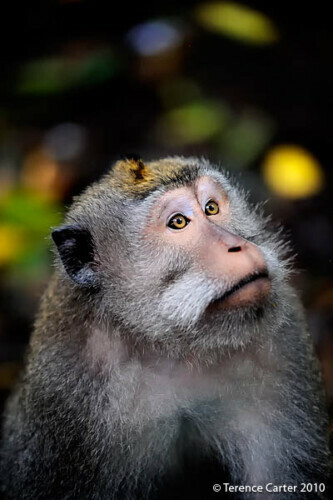 We don’t see any harm in giving the little guys something to eat, as long as it’s appropriate, so buy the bananas sold at the office where you buy your tickets and know that your money goes toward paying for maintenance, conservation and research at the Ubud Monkey Forest. On your way in, you’ll see a sign with instructions as to what to do if a monkey jumps on your shoulders or head (keep walking), steals your food (let them have it), or takes anything else you own (call one of the staff). Read those instructions and follow the advice to the letter: don’t run, don’t try to hide or eat your food, and don’t even attempt to wrestle with a macaque over an iPhone. Let us be really clear, as we’ve seen people who’ve disobeyed the rules and it’s not pleasant. Whatever you do, don’t try to hide food from these furry little guys, or worst of all, retrieve something they’ve stolen. They’re cute and everything but they’re dangerous. And they’re smarter than you think. Just watch them watching you and you’ll see what we mean! For more ideas on things to do, learn, eat and buy, see our guide to Ubud. Hi there. Thanks for the link. Movies can provide wonderful inspiration to travel to a place. I haven’t read the book, and I know people in Bali were sick to death of hearing about it, but, hey, if it makes people aware of a magical place such as Ubud, then there’s no harm there is it? Thanks for dropping by!